In the summer of 2005, I took a boat trip up the Buffalo River. I had a hard time just finding the river, which was hidden beneath elevated highways and closed off from the city by fences and factories. Buffalo River terminus, 2010. Wikimedia Commons, Darmon. Once I made my way to the docks and boarded a motor boat, I spent the next hour on a body of water that appeared moribund in every sense: aquatically, recreationally, and industrially. 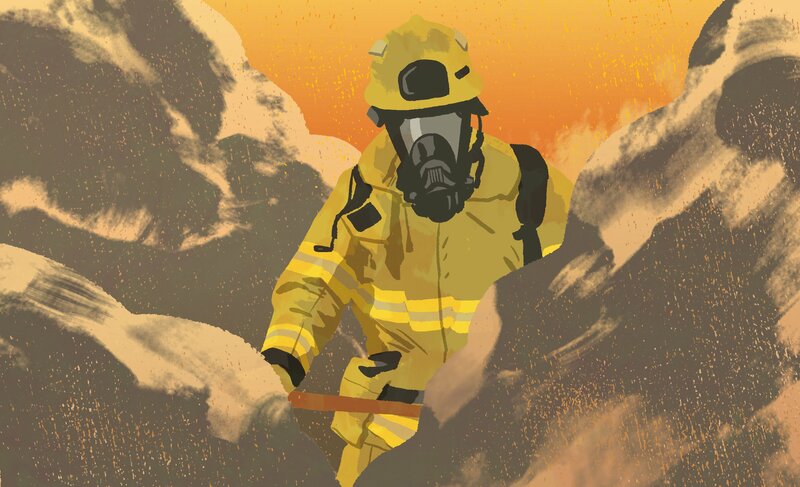 The river caught fire in 1968 and was labeled biologically dead by the Environmental Protection Agency. Not much life had returned since. Empty grain elevators, bearing the names of defunct local breweries, towered over both banks, as tall and as grim as housing projects, remnants of the years before the St. Lawrence Seaway opened in 1959, when Buffalo was the transfer point for agricultural products between the Great Lakes and the Atlantic Ocean. Now, no one had any use for the silos, and they were too expensive to tear down. Even Buffalo’s better-known bodies of water, Lake Erie and the Niagara River, were isolated from city which owed its existence to their presence. 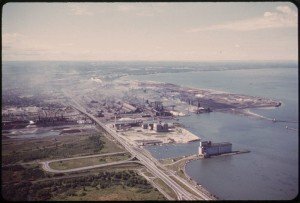 The lakefront was dominated by the brownfield remains of Bethlehem Steel, which closed in 1983, and by the Outer Harbor, a port little used since the Seaway allowed ships to bypass Buffalo. In the 1950s, infamous urban planner Robert Moses ran the New York State Thruway right along the Niagara River. At the time, Buffalonians didn’t mind. The lake and the river were seen as alimentary canals for the steel mills and tanneries. Nobody wanted to live alongside such filth. The Canalside redevelopment, featuring museums, restaurants, historic exhibits, and a full slate of annual festivals. Wikimedia Commons, Andre Carrotflower. Buffalo is the mother of Great Lakes cities—the first to rise to prominence, the first to establish the template of ethnic neighborhoods anchored by churches and taverns, the first to decline from industrial glory. And now it is demonstrating how a Rust Belt city can transform its waterways from polluted industrial resources to fishable, swimmable, kayakable lifestyle amenities. Nearly a decade after I took that spooky boat trip, the Buffalo River is the site of concerts, hockey tournaments, parks, and brand new restaurants. The renaissance of Buffalo’s waterways began at the mouth of the Buffalo River, which the state-run Erie County Harbor Development Corporation has been attempting to transform into a Great Lakes version of Baltimore’s Inner Harbor, even calling it by the same name. This was the birthplace of modern Buffalo—where the Erie Canal ended its 363-mile run from the Hudson River to Lake Erie. [blocktext align=”left”]”We want to transform away from the tradition of the Rust Belt, so the cost of a local economy is not to destroy your natural resource.” [/blocktext] In 2004, U.S. Rep. Brian Higgins obtained $350 million to rebuild the Inner Harbor from the New York Power Authority. The NYPA had made millions from power generated by Niagara Falls, so Higgins negotiated a relicensing agreement that returned the money to his hometown. The Inner Harbor project began with Canalside, where construction crews excavated 320 feet of the Erie Canal terminus and transformed it into a boat slip. Three World War II ships are anchored at a naval park, and a livery rents kayaks for river excursions. On Central Wharf, a wooden boardwalk, seagulls dive for French fries from an open-air restaurant. Coming soon are a children’s museum, a three-story restaurant, and an outdoor skating rink three times the size of Rockefeller Center’s: Buffalo will not be outdone in winter amusements. 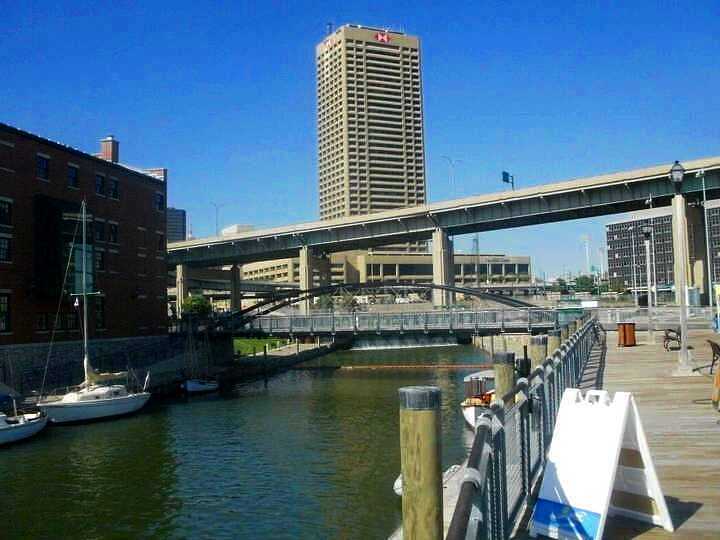 Typical for Buffalo, there’s not a lot of space to work with: the looming Skyway slices through the sunlight and separates Canalside from downtown. But the progress has been spreading up the river and down the lakefront. This spring will see the opening of One Canalside, an office building and hotel in an old state office building. Across the street, Buffalo Sabres owner Terry Pegula is building Harbor Center, with two indoor ice rinks, a hotel, and an eight-story underground parking garage. 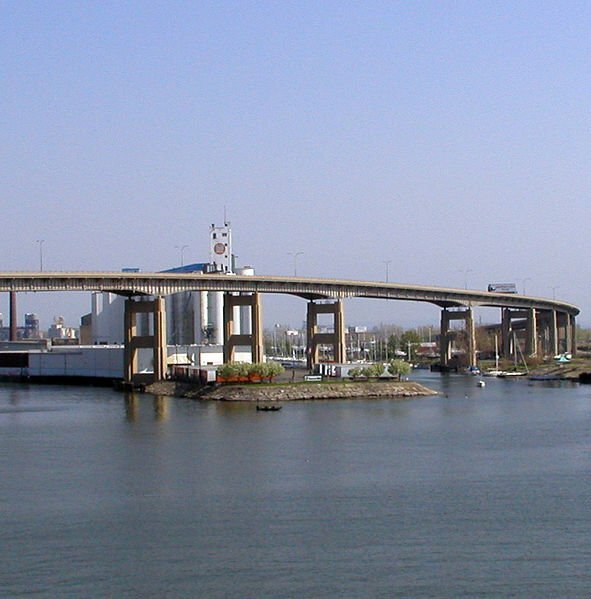 The Buffalo Skyway as it passes over the Buffalo River just south of downtown. Wikimedia Commons, Darmon. Canalside was also the key to opening the Buffalo River to development. A $44 million cleanup, paid for by the Environmental Protection Agency and private industry, is dredging the river of sediment deposited by decades of producing steel, coke, pesticides, and dyes. The Corporation is also spending $5 million to project light shows on the grain elevators. Modeled on the lighting of the Eiffel Tower and the Bay Bridge, and hearkening back to Buffalo’s past as “The City of Light” at the electrified 1901 Pan-American Exposition, the shows have attracted fascinated crowds and national attention. 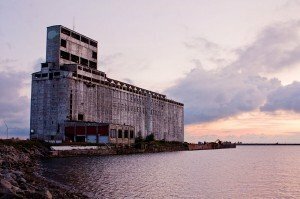 Cargill Pool Grain Elevator in Buffalo. Wikimedia Commons, Yatpay. John Norquist, the former Milwaukee mayor and current president and CEO of the Council for New Urbanism (which is holding its annual conference in Buffalo this year) once said that Robert Moses’s “dead gray hands are still strangling the city of Buffalo.” As a result of the Thruway, Buffalo’s Riverside Park—the last urban space designed by Frederick Law Olmsted, with a white block casino, a classical bathhouse for the swimming pool and stone steps terracing the grassy slope to the waterfront—was cut off from its namesake. Now, to walk from Riverside Park to the river, pedestrians have to cross a skyway over six lanes of traffic just to reach a twenty-foot strip grass between the Thruway and the river. In modern Buffalo, this is a riverfront park. The idea of rerouting the Thruway off the riverfront began with a neighborhood organization called Rediscover Riverside. 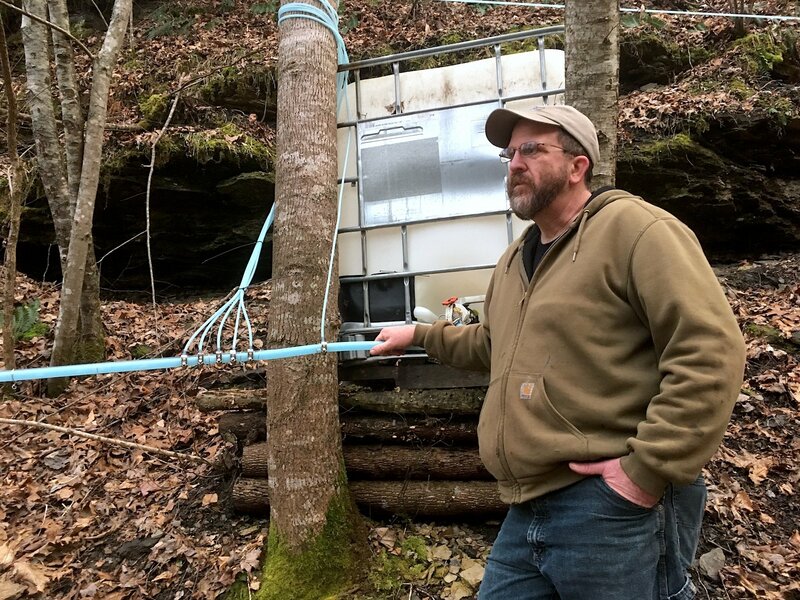 At first, it seemed as crazy as cleaning up the Buffalo River or building a restaurant in a grain silo must have sounded. But now, it’s being talked about as part of a long-term plan for reclaiming the waterfront. The Robert Moses Parkway, which hugs the waterfront south of Niagara Falls, is already scheduled for demolition. Someday, that could happen in Buffalo, too. Norquist made his political career as an opponent of freeways. As mayor, he blocked the extension of the Park East Freeway to Lake Michigan, and built a Riverwalk that resulted in a downtown housing boom, including 28-story and 30-story apartment buildings. Tearing down and rerouting highways would likely be a multi-billion dollar task. Robert Gioia refers to the Skyway and the Thruway as “lessons learned,” but realizes they are on the waterfront to stay, at least for the near future. For now, Buffalo has to do a better job of establishing “cross-connectivities” between the city and the lake, he said. But what would opening up the waterfront mean to the people who live down there now? Would they be forced to leave if the land becomes more desirable? When Bonnie Eschborn founded Rediscover Riverside, she was rooting for gentrification. Eschborn grew up in Riverside before the Thruway was laid down, when the neighborhood was home to blue-collar Poles and Italians, many employed at the nearby GM engine plant in Tonawanda. 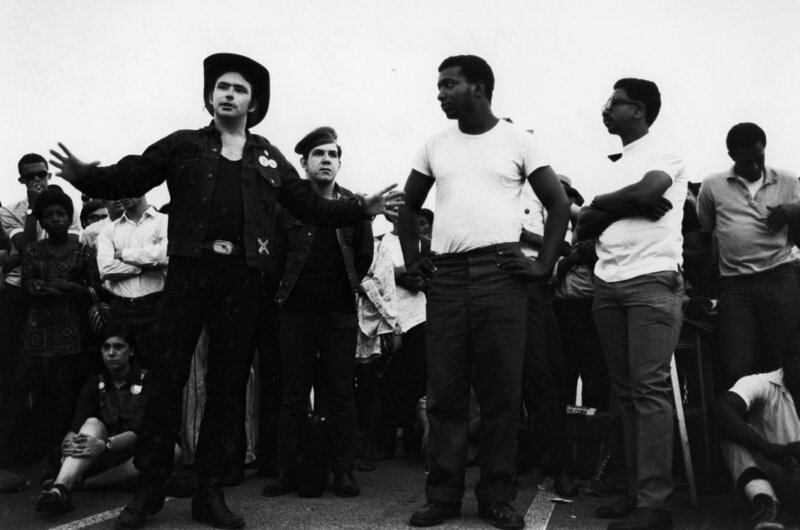 The highway provided them a route to the suburbs, and they were replaced by lower-class whites. Most residents are renters, the average household income is $24,356 a year, and the average owner-occupied house is worth $59,300. The crime rate is nearly triple the statewide average. This less than a hundred yards from one of North America’s most storied rivers. But the salient feature of Riverside is no longer water, it’s a loud, dirty, six-lane road, which has turned out to be even less appealing than the polluted riverfront it replaced. Now that the river is not so polluted, Eschborn estimated that rerouting the Thruway would double property values in Riverside to the same level as those in Tonawanda, where the road swings away from the river and onto Grand Island. 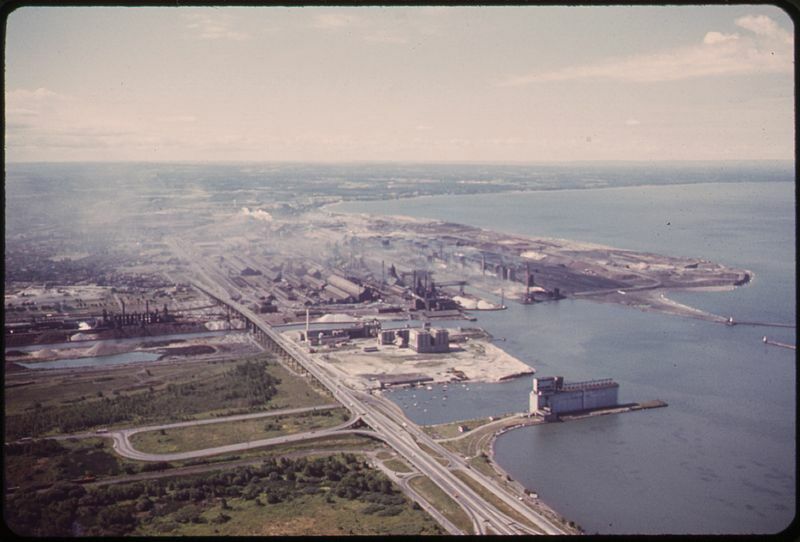 Aerial view of Bethlehem Steel Plant at Lackawanna on the shores of Lake Erie just below Buffalo, circa 1970. Wikimedia Commons, Environmental Protection Agency. The largest parcel of lakefront property in the Buffalo area is the 1,600-acre Bethlehem Steel site in Lackawanna, directly south of the city, where Lake Erie begins to narrow into the Niagara River. The mill closed in 1983, and the grounds have been reverting to nature ever since, with whitetail deer bounding through meadows of chicory, goldenrod, yarrow, and peppergrass. As a brownfield, still littered with slag pots, the site is too polluted for housing or recreation. Until recently, the only enterprise operating on the site was up in the air: Steel Winds, 14 wind turbines gathering breezes from Lake Erie. The turbines generate 50 million kilowatt hours of electricity each year, enough to power 9,000 homes, and have become symbols of Buffalo, appearing in establishing shots during Bills games. Nonetheless, Bethlehem Steel is off-limits to the public, surrounded by a fence hung with “No Trespassing” signs. And its beach looks like a landscape from the post-apocalyptic movie The Road (which was filmed on Lake Erie.) Metal glitters in the ragged cliff, and the sand looks gray. You might want to swim here, but you wouldn’t want to get out of the water. In the summer of 2013, the Canadian manufacturer Welded Tube opened a 40-acre factory to build steel pipe. To accommodate the new enterprise, and to make it easier for other businesses to locate there, the state of New York spent $4.4 million to reroute a rail line through the site. Local officials hope Welded Tube is the beginning of the lakefront’s return to industrial role it played for most of the 20th Century. In Chicago, Mayor Rahm Emanuel is trying to reintegrate the Chicago River back into the life of the city, by extending the Riverwalk along its entire main branch. Emanuel’s plan calls for six stations, each devoted to a different method of interacting with the water—kayaking, dining, a floating garden, an ecology learning center, a boat launch. Emanuel’s administration also built a canoe and kayak livery on each branch of the river. Along the lakefront, the city has extended Lake Shore Drive through U.S. Steel South Works, which closed in 1992, in preparation for a development which is expected to have 13,575 new homes, 17.5 million square feet of retail space—and revive the economic fortunes of South Chicago, a neighborhood that has struggled ever since it lost the mill. In Detroit, the Riverfront Conservancy built a three-and-a-half mile river walk, with the help of General Motors, which donated land behind the Renaissance Center, and the state, which dedicated a new park to former Michigan governor William Milliken. Long-term plans call for extending the river walk to Belle Isle. Cleveland just announced it will lease 28 acres of empty lakefront behind the Browns’ football stadium to developers who plan to build 1,000 apartments, a school, and retail arcades. On the Cuyahoga River, the Flats East Bank project will bring restaurants, a hotel, and an office building to an unused stretch of riverbank. 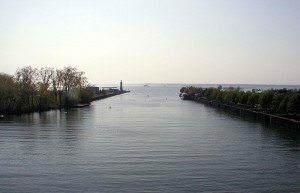 The Northeast Ohio Regional Sewer District is spending $3 billion to clean up sewage discharge that sullies Lake Erie after heavy rains. That’s exactly where Buffalo was in the mid-2000s. The entire Rust Belt can take a lesson from what they’ve done about it. Edward McClelland is the author of Nothin’ but Blue Skies: The Heyday, Hard Times and Hopes of America’s Industrial Heartland. Great coverage of my hometown. Word to the wise, Buffalo, take note: Baltimore is doing what it can to UNDO the inauthentic, touristy nature of its Inner Harbor. This is NOT the model you want to replicate–continue down the authentic, lighter-quicker-cheaper path until something truly world class can be built….which should be for the locals more than anyone else. Tourists will flock to an authentic venue more anyways…. Right on. This was spoken to the citizens and leaders of Buffalo a decade ago when A Canal Conversation took place, shortly after the unearthing of the Commercial Slip. Authenticity is huge. Good comment. I’ve been reading about the canal and I’ve wondered what people’s thoughts would be about it today. Most people probably don’t even realize when they’re driving the 190 along the river that the Erie Canal is right beneath them. I’m sure that’s what made it a natural location for a highway: the route basically already existed..
Obviously the waterfront is less than ideal in our eyes today. However, isn’t that the perfect location for it? The Erie Canal was a route for transporting people, goods, commerce, et al. Now the 190 is the same thing. If anything, building over the canal saved countless neighborhoods from being demo’d for putting the 190 in an alternate location. I think it’s more like 5 stories. And above ground. A nice piece, but it runs the risk of allowing people to think that Buffalo’s waterfront renaissance is just 7 or 8 years old. Many of the developments that McClelland writes about were in various stages of discussion back in the 1980s, when I was a young business reporter there. And in Niagara Falls, the political nightmare the Robert Moses Parkway created among members of the tourism industry began before that expressway was ever built, and is directly responsible for leaving that city in a depressing and woeful state that should be unfathomable given its location at the edge of a global tourist attraction. My point isn’t to find fault with McClelland’s story, but to point out that the good news coming out of Buffalo isn’t new or sudden. I hope that someday my own home town of Cleveland may also be heralded as an overnight sensation after a mere 30-40 years of serious discussion about the issue of lake access. Baltimore benefited greatly by staunchly resisting plans to run I-95 along the waterfront through downtown (long-time US senator Barbara Mikulski got her start organizing the opposition). Now all those former working class neighborhoods along the water that were slated for removal are the city’s economic foundation. One thing that struck me when I moved from there to Cleveland is how little the lakefront figures into the city’s life here. You’d think politicians and developers would have been salivating at the idea of redeveloping Burke airport or the land around Browns stadium 20 years ago. I grew up a few blocks south of Riverside Park and less than two blocks from the river. The time was the ’30s, to the ’50s. It was beautiful until that sub-human monster Robert Moses got his dirty hands on it. You could dive into the river from the base of the lighthouse. Lounge on the banks from the Niagara Street road down to the river. The landscaping was perfect. Get that Thruway out of there as soon as possible!